Denning Paint For All Your Painting Needs in Reidsville, NC...We Can Do It All! 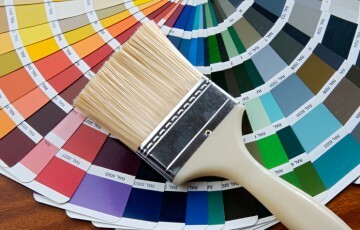 There is nothing as appealing, efficient, and long-lasting as a professional paint job. Denning Paint, LLC understands that and has been serving Reidsville, NC and surrounding areas with professional painting contractors for over 40 years. Since 1974, owner Dennis E. Denning has completed difficult paint jobs quickly and thoroughly so both residential and commercial properties have a perfect paint job that lasts for many years to come! Unlike other corporate painting companies, Denning Paint, LLC is locally owned and operated and is a family painting business! Dennis E. Denning's twin sons, Dylan and Matthew, are developing a keen knowledge of the family business as they have recently joined the crew at Denning Paint, LLC. The "purpose of painting" is to improve the aesthetic of the building and to protect it from damage by water, rust, corrosion, insects and mold. Our family of skilled, professional painters can perform painting services on residential, commercial, and industrial properties. Denning Paint, LLC is more than just painting! We can handle everything involving paints, stains, pressure washing, restoration, repair, and more! All work done by Denning Paint is licensed and insured to comply with mandatory regulations. Denning Paint, LLC is proud to be Better Business Bureau accredited with an A+ rating. Our unparalleled experience in the area guarantees a quality job that you will be absolutely satisfied with for years to come. Contact us today for a free estimate on your project! We are proud to serve Reidsville, NC; Greensboro, NC; Burlington, NC and the surrounding areas. Copyright ©2019 Denning Paint LLC. All Rights Reserved.